What Caused This Refractory Unilateral Pruritic Hyperpigmented Eruption? 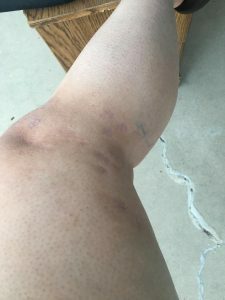 A very young otherwise healthy and active female presented with greater than 5 years duration of refractory and debilitating bouts of itching on the right lateral knee, right lower leg, and dorsal foot. 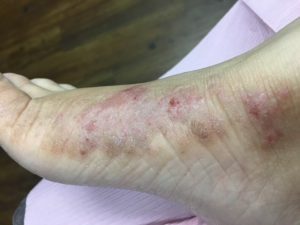 She had seen multiple dermatologists for resultant right leg severe prurigo nodules, hyperpigmentation, lichenification, and more than 40-50 raised, rough, “wart-like” papules. Her left leg was completely clear and the remainder of the physical exam was unremarkable. One dermatopathology report dated 3 years prior showed “papulosquamous dermatitis, lichenified with no evidence of psoriasis”. Exam of the low back confirmed moderate spinal tenderness over L4-L5-S1 and was associated with bilateral muscle spasm, particularly of the left side. Her medical history was not significant for any disease, surgeries, or hospitalization. Pertinent history included several years status post one motor vehicle accident and periods of extended daily driving for work. Patient denied neck or back pain, or debility. 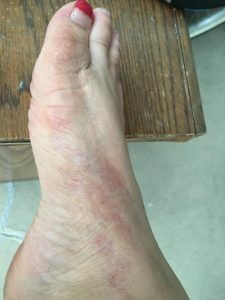 In summary, she had an atypical dermatomal ( L4, L5-S1) distribution of lichenification and prurigo nodules accompanied by skin dysesthesias on her right lower extremity, for which she had failed numerous therapies including topical and intralesional steroids, phototherapy with narrow band UVB, steroid impregnated tape, and oral and topical antihistamines. PHOTOS OF ITCHY KNEE, FOOT, LEG before our diagnosis and therapy. 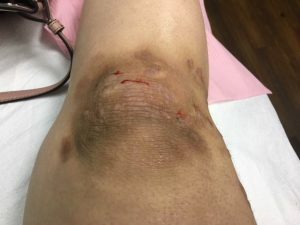 PHOTOS OF ITCHY KNEE, FOOT, LEG after our diagnosis of spinal parestehtica or SISS and therapy. MRI photo of spine showing L4-L5-S1 disc disease and cause of itch. Photo of spine showing L4-L5-S1 disc disease and cause of itch. 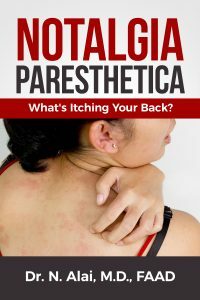 Spinal paresthesias are neurocutanoeus disorders which embody the “skin-spine connection” including Notalgia paresthetica (NP), Brachioradial Pruritus (BRP), and Merralgia Paresthetica. (MP).These conditions are heavily under-recognized and under-diagnosed causes of episodic and chronic, localized, dysesthesias and itching of the mid back, upper extremities, and lateral thighs respectively. While NP and BRP are often described as independent conditions, these two conditions do often occur concurrently or serially in the same individual. 1, 2 Similarly, the described L4-L5-S1 paresthesia are not uncommon and do frequently occur contiguously in the same patients with NP and BRP. Paresthesia refers to a burning or prickling sensation that is usually felt in the hands, arms, legs, or feet, but can also occur in other parts of the body. The sensation, which happens without warning, is usually painless and described as tingling or numbness, skin crawling, or itching. “Spinal paresthesias” like NP and BRP may in fact represent the same spectrum of one pathophysiologic neuropathic disorder originating from the cervical spine, whereas the condition described herein originates from the lumbosacral spine. A paradigm shift in the dermatologist’s recognition of spinal paresthesias including NP, BRP, and MP as neurocutaneous disorders, and a new approach to treatment is warranted, with a focus on eliciting relevant spinal history including cervical or lumbar muscle spasm, trauma, arthritis, degenerative disk disease, and other spinal neoplasms. Topical therapies for spinal paresthesias including NP and BRP have been highly inconsistent and unsatisfactory in a majority of patients. Further, appropriate patient education for both spinal paresthesias requires discussion of potential spinal conditions and clear awareness of the probable association of the localized itching with underlying spinal and musculoskeletal disease. Radiographic studies of the spine including plain film and MRI should be much more considered in primary evaluation of refractory spinal parethesias including NP and BRP than current standards. First line therapy for spinal parethesias with associated spinal disc disease should include consideration of potential non-dermatologic therapies aimed at the spine. Such lumbosacral spinal treatments include transcutaneous electrical stimulation (TENS), electrical muscle stimulation (EMS), acupuncture, spinal traction, spinal manipulation, physical therapy, massage, muscle strengthening and range of motion enhancing routines, passive continuous motion (PCM), oral non-steroidal anti-inflammatory medications, and oral and topical muscle relaxants as required for resistant disease. Similar to prognostication of standard cervical or lumbar musculoskeletal diseases, spinal paresthesias including NP, BRP, and MP are generally chronic, controllable conditions with periodic remissions and exacerbations. On her first visit, based on clinical acumen and provisional diagnosis of atypical low spine “notalgia paresthetica/merralgia” the following workup was efficiently undertaken. MRIs of the complete cervical, lumbar, and thoracic spine were ordered as well as a battery of laboratory tests for pruritus including but not limited to complete blood count, hepatitis screen, full chemistry panel, our proprietary comprehensive autoimmune order set, and IgE. Pertinent abnormal findings included positive antinuclear antigen antibody 1:1280- nuclear dot pattern, elevated complement C4a 2820.3 (0-650), positive antiproteinase 3 (PR-3) antibodies 4.6 (0-3.5) elevated creatinine 1.08 ( 0.57-1.00), elevated C-reactive protein 8.3 ( 0-4.9), elevated DHEA-S 432.9 (84.8-378), elevated insulin 35 (2.6-24.9), and positive H. plyori breath test. On her first visit, based on clinical acumen and provisional diagnosis of atypical low spine “notalgia paresthetica/merralgia” the following workup was efficiently undertaken. MRIs of the complete cervical, lumbar, and thoracic spine were ordered as well as a battery of laboratory tests for pruritus including but not limited to complete blood count, hepatitis screen, full chemistry panel, our proprietary comprehensive autoimmune order set, and IgE. MRI demonstrated (1) L5-S1 tear of the posterior annulus fibrous with a 4.5mm central disc protrusion, compression of the transversing S1 nerve roots, and moderate to severe stenosis; and (2) L4-L5 tear with a 5mm broad-based left paracentral disc protrusion, and severe stenosis with questionable compression of the traversing left L5 nerve roots. Skin lesions and symptomology completely cleared over a few weeks using our novel multimodal therapy program for spinal paresthetica utilizing a customized clearing and maintenance phase schedule directed at lumbosacral spine and disc disease at L4-L5-S1. The main components of our specialty program utilized are in-office and at-home TENS and EMS, acupuncture, phototherapy with narrow band ultraviolet B (NB UVB) for generalized pruritus control, physical therapy targeting the cervical and lumbar areas, infrared phototherapy, hydroxyzine for breakthrough pruritus, and intralesional cortisone for any refractory prurigo nodules. We also initiated appropriate referrals for neurosurgery, rheumatology, primary care, and physical therapy, and separately ordered liver and pelvic ultrasounds to screen for biliary cirrhotic disease and polycystic ovaries ( PCOS) respectively. Once the appropriate spinal treatments were employed and the underlying spinal cause addressed, our patient was doing exceptionally well dermatologically at approximately 1, 2,6, and 9 month follow-ups with complete resolution of symptoms and remission of skin findings. She declined neurosurgical treatment and elected to continue physical therapy which has worked very well for her. Spinal Paresthesias including Notalgia paresthetica (NP) and Brachioradial Pruritus (BR) are not true dermatologic disorders, but rather cutaneous signs of underlying systemic disease. 1-5 NP and BRP are predominantly associated with varying degrees of cervical muscoskeletal disease ranging from asymptomatic and extremely mild cervical muscle spasm, to severe spinal stenosis and cord impingement at C4-C6 with corresponding upper extremity radiculopathy. 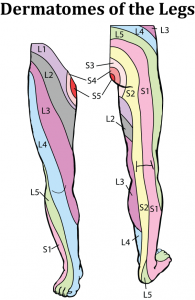 Similarly the “lumbar paresthesia” described herein is associated with spinal pathology most commonly at L4-L5-S1. Spinal paresthesias (SP) or Skin-Itch-Spine syndromes (SISS) including NP, atypical presentations of NP, BRP, MP, scalp paresthesias (10), and burning scrotum syndrome are much more likely than not, dermatologic signs of underlying systemic disease. 1-4 The clinical pearl is to treat the spine (underlying cause) and the skin (referred secondary symptoms) will follow. 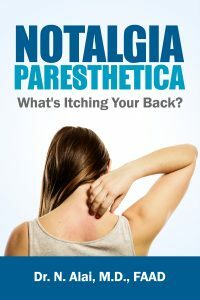 “Spinal Paresthesias” and “skin-itch-spine syndromes” or “SISS” are two new terms coined by this author to encompass diseases including notalgia paresthetica, brachioradial pruritus, merralgia paresthetica, burning scrotum syndrome, and burning scalp. disease at C4 through C7. Cutis. 2010 Feb;85(2):77-81. Goodkin R, Wingard E, Bernhard JD. Brachioradial pruritus: cervical spine disease and neurogenic/neuropathic pruritus. J Am Acad Dermatol. 2004 May; 50(5):800-1. Savk E, Savk SO.On brachioradial pruritus and notalgia paresthetica. J Am Acad Dermatol. 2003 Apr;48(4):521-4. Savk E, Savk O, Bolukbasi O, Culhaci N, Dikicioğlu E, Karaman G, Sendur N. Notalgia paresthetica: a study on pathogenesis. Int J Dermatol. 2000 Oct; 39(10):754-9. Savk E, Savk O, Bolukbasi O, et al. Notalgia Paresthetica: A Study On Pathogenesis. Int J Dermatol. 2000;39:754-759. Savk E, Savk O, Sendur F. Transcutaneous electrical nerve stimulation offers partial relief in notalgia paresthetica patients with a relevant spinal pathology. J 2007;34:315-319. Thornsberry LA, English JC 3rd. Scalp dysesthesia related to cervical spine disease.JAMA Dermatol. 2013 Feb. 149(2):200-3.